A good French omelette is a smooth, gently swelling, golden oval that is tender and creamy inside. And as it takes less than half a minute to make, it is ideal for a quick meal. There is a trick to omelettes, and certainly the easiest way to learn is to ask an expert to give you a lesson. — Julia Child. In our last post we traced the origin of the omelette recipe (or at least one of the origins) to François Pierre de La Varenne, but what we did not expect in our research was to draw a straight line to Julia Child. 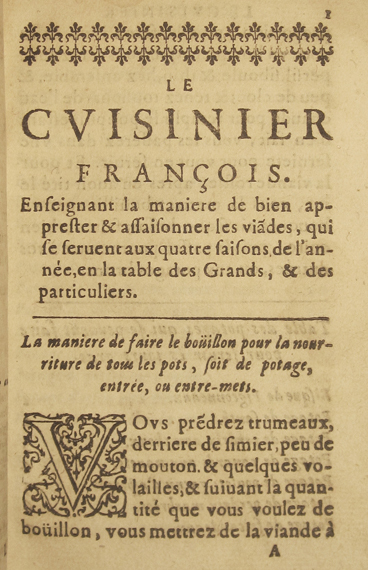 Through our research, we discovered that not only did Child own two 1712 volumes of La Varenne’s Le Cuisinier Fran FRANÇOIS, but also she carried on the style and type of cuisine pioneered by La Varenne’s incipient textual project. 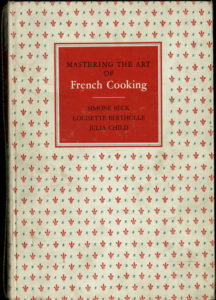 Child’s two volumes of La Varenne’s text can be found within her significant personal collection of 5,000 cookbooks, which are now catalogued at the Radcliffe Institute’s Schlesinger Library on the History of Women in America. Marylène Altieri, Curator of Books and Printed Materials, and Honor Moody, Rare Book Cataloger, informed us that Child rarely marked any cookbooks dating before 1900 (even with an ownership signature). A rare exception is an annotated copy of Larousse Gastronomique E, “but otherwise she did not [generally] mark her collection of research books. On the other hand, she marked her own publications with many corrections for future printings”, especially Mastering the Art of French Cooking (hereafter MAFC). Julia Child, Louisette Bertholle, and Simone Beck, Mastering the Art of French Cooking (1961). Credit: Harry Ransom Center. When we further discovered that the Harry Ransom Center at the University of Texas at Austin held Julia Child’s editorial correspondence, we could not resist the opportunity to dive into the behind-the-scenes creation of MAFC, one of the most iconic cookbooks ever published. 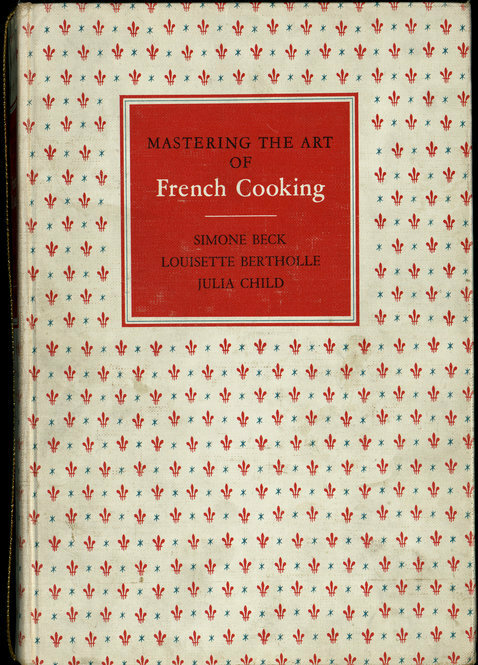 Starting from its 1960s publication, this best-selling cookbook introduced French cooking into countless homes. 1950s America was not far removed from the restrictions and rationing of wartime (or the generational memory of Depression-era food shortages). Like their medieval and early modern forebears, those responsible for feeding themselves and their families prioritized sustenance and ease of preparation. The post-War generation was naturally enamoured with convenient and cost-effective processed foods, such as Jell-O and frozen TV dinners. While time-saving kitchen appliances like refrigerators and electric mixers made daily cooking quicker, home cooks across the country needed help transforming the everyday chore of cooking back into an educational, pleasurable experience, as La Varenne had once done. 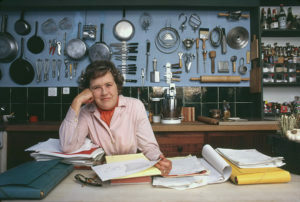 Enter Julia Child, a chef who helped introduce the idea of gourmet home cooking for modern audiences. Rather than settling for convenience, she advocated for cooking as a meticulous process that allowed room for error and fostered hospitality. She revived interest in taste over function, preaching the value of simple, local ingredients and flavors developed with care and attention. Photograph of Julia Child in her kitchen for McCall’s Magazine, France, 1970. Credit: Harry Ransom Center. While her husband was stationed in Paris, Child decided to attend Le Cordon Bleu. Shortly after, she met French chefs Simone (“Simca”) Beck and Louisette Bertholle at Le Cercle des Gourmettes, a culinary club for women in Paris. Child’s eventual bestseller, co-written with Beck and Bertholle, drew inspiration from her close friendships with these women. 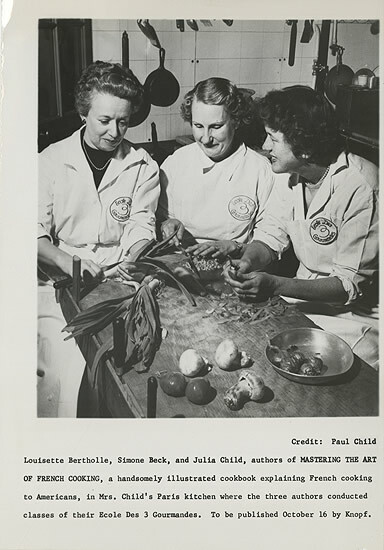 L’École des Trois Gourmandes: Louisette Bertholle, Simone (Simca) Beck, and Julia Child, 1953. Credit: Harry Ransom Center. In 1952, the trio started L’École des Trois Gourmandes, an informal “school” primarily aimed at American women living in Paris who wanted to learn about French cuisine. The lessons were held in Child’s kitchen. Although the school “closed” in 1953 when Child moved to Marseille, their collaboration was the foundation for Mastering the Art of French Cooking, a 734-page encyclopedic cookbook published in 1961. In effect, this trio had translated the collaborative kitchen environment developed over centuries in France for home cooks across the world. Once again, a chef’s decision to share knowledge with the world, using the medium of a book, inspired generations to attempt “professional” skills from the comfort of their home kitchen. 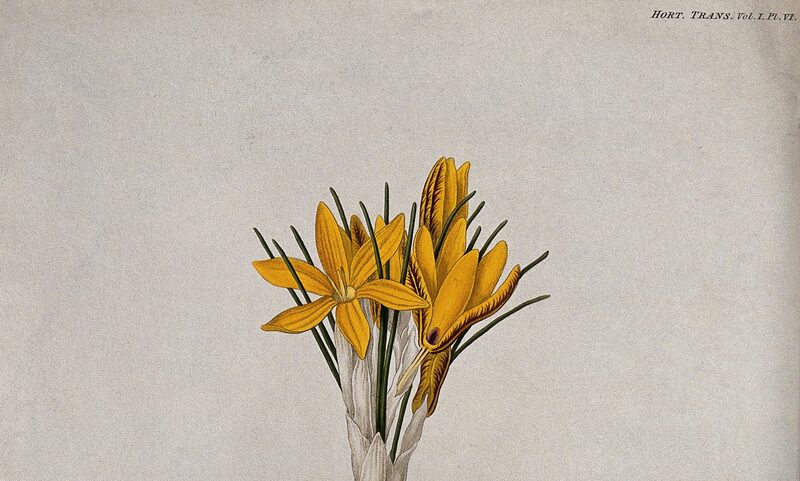 By creating a systemized text to train the next generation of home cooks, they continued the cultural exchange began by La Varenne in 1651 (for more on early modern cooking, particularly female alliances in the kitchen, see previous RP post by Amanda Herbert). 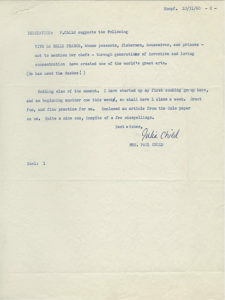 A letter from Julia Child to Judith Jones, 31 October 1960, p. 1. Credit: Harry Ransom Center. 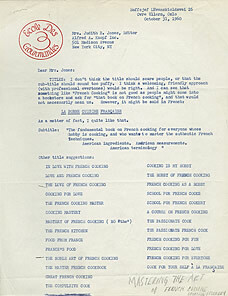 The voluminous Alfred A. Knopf, Inc. collection in the Harry Ransom Center archives includes the editorial correspondence between Julia Child and her Knopf editors Judith Jones and Carol Brown Janeway. Looking at pages of contracts, book-signing notices, and editorial letters revealed the work of active editors. At their best, an editor ventriloquizes purpose back to the author, creating a loop of meaning that frustrates a sense of singular authorship. They also facilitate translations of works into other languages. 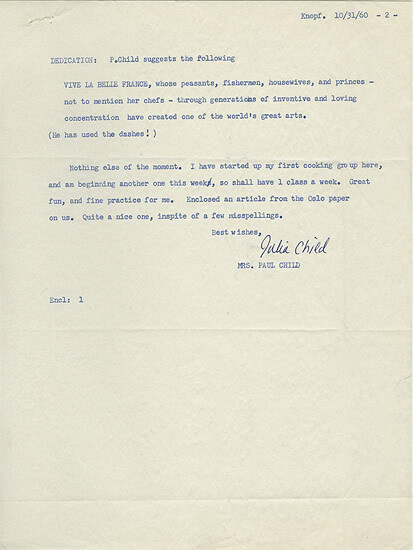 A letter from Julia Child to Judith Jones, 31 October 1960, p. 2. Credit: Harry Ransom Center. Judith Jones, Julia Child’s primary editor, began her career at Alfred A. Knopf as a French translation reader. She was quickly promoted to editor, ultimately spending 50 years at the publishing house. She recently passed away at the age of 93, and is remembered best for her dual passions for cooking and editing. These shaped her editorial collaborations with not only Julia Child, but also chefs like Jacques Pépin, Alice Waters, and Claudia Roden. It also inspired her to write her own cookbooks and blog, including The Pleasure of Cooking for One. When adapting manuscripts for new audiences, cookbook translators often prioritize word-for-word accuracy, useful equivalencies across different measurement systems, and cross-cultural labeling of ingredients. Caution is advised, as altering formatting and spacing of the text also can change meaning. 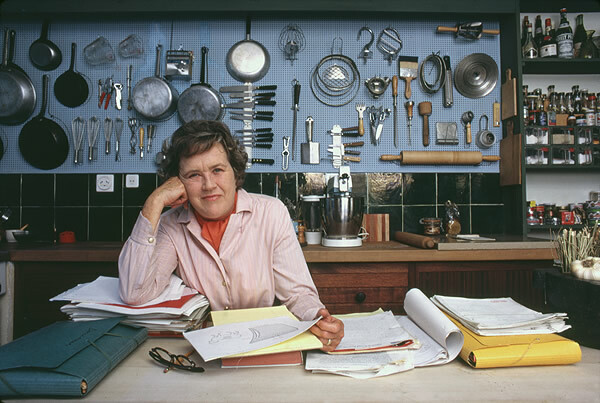 Julia [Child] has always been very dissatisfied with what [British editors] did…they entirely changed the layout of the book which reduced to nonsense her whole method of teaching recipes. Child was meticulous in her kitchen pedagogy, providing exacting instructions interspersed with diagrams for proper technique. The original MAFC progresses deliberately: beginning with basics such as knife skills, followed by tips selecting and using ingredients like wine, and building to the most simple type of recipes, soups. Just as La Varenne had done three centuries earlier! 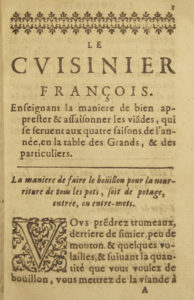 When the British editors rearranged the layout, they disrupted this meticulous process, transforming the book from a process of skill-acquisition to a collection of recipes. Notwithstanding the potential difficulty, MAFC was rapidly translated into numerous languages including Finnish, Danish, Chinese, Russian, Italian, Korean, Dutch, and Spanish, and a second volume was ordered for 1970. If all this talk about food makes you hungry, head to MAFC, Volume 1, to whip up a delightful omelette. It’s what Julia would want you to do. Combine the eggs, seasonings: In a medium bowl, whisk together the eggs, salt, pepper and water, if using, until just blended. Set aside. Cook the omelet: Place a nonstick skillet over high heat. Add the butter and tilt the pan in all directions to coat the bottom and sides. When the butter foam has almost subsided but just before it browns, pour in the eggs. Shake the pan briefly to spread the eggs over the bottom of the pan, then let the pan sit for several seconds undisturbed while the eggs coagulate on the bottom. If adding any fillings, such as sauteed vegetables, do so now. Start jerking the pan toward you, throwing the eggs against the far edge. Keep jerking roughly, gradually lifting the pan up by the handle and tilting the far edge of the pan over the heat as the omelet begins to roll over on itself. Use a rubber spatula to push any stray egg back into the mass. Then bang on the handle close to the pan with a fist and the omelet will start curling at its far edge. Unmold the omelet: Maneuver the omelet to one side of the pan. Fold the third of the omelet farthest from you over on itself. Lift the pan and hold a serving plate next to it. Tilt the pan toward the plate, allowing the omelet to slide onto it and fold over on itself into thirds. Presentation: Spear a lump of butter with a fork and rapidly brush it over the top of the omelet. Garnish with parsley. Beck, Simone, Louisette Bertholle, and Julia Child. Mastering the Art of French Cooking. Knopf, New York, 1961.